This is an expansion only. Requires the Base Game to play. A campaign with many varied scenarios awaits you. 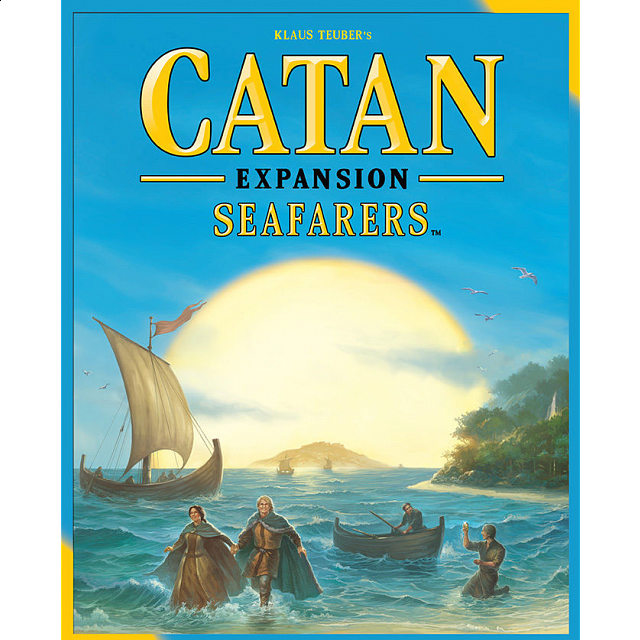 The Seafarers expansion contains new frame pieces, which - together with the frame pieces of the Catan base game - can be used to assemble frames of variable size. Inside these frames, you lay out always varying combinations of islands, using the hexes of the Catan base game and additional hexes of the expansion set - either as shown in the scenario diagrams or according to your own imagination. 15 ships of each player color are included. Building a ship costs 1 lumber and 1 wool. When you build a new ship, place it adjacent to a coastal settlement or a ship you have already built. As you can see, the rules for placing ships are similar to the rules for placing roads on land. There is, however, one important exception: you may change the position of the front ships of a shipping route! That way, you can react more flexibly to your opponents' actions and perhaps be the first to reach an unsettled, productive island. Other new features are the gold fields, which help the owners of adjacent settlements or cities obtain any type of resource, and the pirate, who causes unrest on the peaceful seas.